When the DC branch of the St. Louis Pizzeria first rolled into town, Mr. Green Bean and I had high expectations. Hailing from the Mr.’s hometown and claiming to fire-up delicious g-free pie’s, we couldn’t wait to try it. Now we’ve been back on several occasions for the better than average food and the lively, laid-back vibe. Pi scooped up some serious real estate in the jam-packed Penn Quarter neighborhood, making this pizzeria a great place for large parties. Mention your gluten allergy at Pi and the servers will confidently help you navigate the menu from GF beers and starters to pizza pies. There are actually only a few items on the Pi menu that one should avoid. The hummus plate can be served with gluten free pita wedges, the wings are surprisingly safe, and the selection of “Pi Snacks” offers plenty of munching options. The only pizza topping off limits is the meatballs, fine by me (Meatballs belong in a pasta bowl anyway). Coming from a family that always pairs pizza with salad, I recommend the Bada Bing, with field greens, toasted almonds, gorgonzola cheese, dried bing cherries, and a not-too-sweet raspberry vinaigrette. Bada Bing Salad with toasted almonds, dried bing cherries and gorgonzola cheese. District of Pi takes serious precautions to avoid pesky wheat flour drifting onto wheat-free crusts. They start with Rich’s 10 inch, GF certified dough, and train the staff to use separate utensils and clean work surfaces. GF pizzas are cooked in the same deck oven as other pizzas, but a designated pizza peel is always used for safe maneuvering. The result is a crispy, buttery, thin crust much like many others I’ve tried. Pi excels in their unique topping combinations such as my favorite so far, the Lincoln Park, with mozzarella, garlic olive oil, zucchini, fresh tomatoes, feta and fresh basil. Gluten-free Pizza, with half Lincoln Park, half Central West End toppings. For non-allergic patrons, Pi’s specialty is their deep dish crust (I drool). I would love to see Pi experiment with creating a g-free version—tricky no doubt, but not unfathomable. If that’s biting off more than Pi can chew, perhaps they could attempt a g-free house-made dough that more closely resembles their wheat-based thin crust, which Mr. Green Bean highly recommends. One word on dessert and a pre-caution to those avoiding wheat: While ice cream provides a sweet finale, don’t get excited about the “Apple Pi” made in a deep dish cornmeal crust (which would personally be my dream dessert)…it is not gluten-free. Work on that too, Pi. 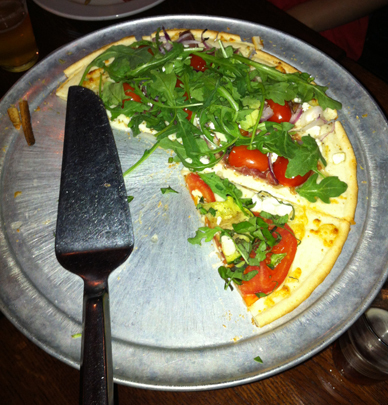 Categories: 3 Spoons, Gluten-Free, Pizza, Washington DC | Permalink. Our server last month told us that you have to pre-order the GF deep dish when you make a reservation… I haven’t tried it yet. Wow, that’s very interesting. Perhaps it’s a new menu option. I would love to try it. Thanks for sharing! That’s interesting… When I went in February they told me it was the same oven but they couldn’t tell me that they were using a separate surface. Have you tried Fuel Pizza? The GF crust is 80 times better. Haven’t been to Fuel yet, but looking forward to it, especially with your recommendation. Thanks! Have any of your recommendations on these gluten free places changes in the last year or two since you posted? I will be visiting the Woodley Park area from out of town next month for business and am esp. interested in Open City, District of Pi, and Pete’s Apizza–I’m a very sensitive celiac! Thanks! You should always check on kitchen practices and menu items with your server, as restaurants do frequently change policies and modify their menus. However, Open City, District of Pi and Pete’s Apizza all still take extra precautions during food prep and offer many gluten free items and pizza. If you are an especially sensitive celiac, you may want to call ahead and double check that kitchen practices will meet your standards. I do think that these are good options for your visit. Another good option in Woodley Park is Lebanese Taverna. They are accustomed to handling gluten-free diners and will take good care of you. Have a nice visit!